One thing that I have learned is that God’s mission has a church, not the other way around. 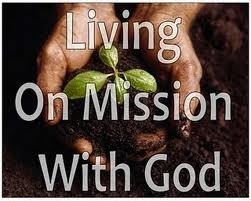 Now when see each one as part of the big picture in the mission of God, change will burst and lead to an awakening. Such event will produce a new motivation, a new outlook, and a new global-minded mission. In order for this to happen there needs to be a new passion in the church. A passion that burns within the soul to share the love of Jesus to all people, race, and culture. Believers have to step out of their norms, boundaries, and comfort to have an impact in today’s generation. Passion and urgency were the key ingredients that led the apostles and early church to pass on the gospel. Obviously God was at work through the Holy Spirit. The fact that forgiveness of sin and salvation had come through Jesus Christ, and was now available to all those who would believe, was the amazing news that motivated and fueled the triumph and success of the spread of Christianity. Church today has changed in so many different ways, both for the positive and negative. Technology has improved and increased the chances and opportunities for the spread of the gospel. A lot of ministries have entered the radio and TV to broadcast weekly sermons, teachings, and conferences. Not to mentions all the different varieties of church apps that are now available on several phone companies. We can almost say that there is no excuse for people to hear the good news. The problem is no personal and relational interaction. Even with this big advantage, there is still a lot of work to be done around the world. Still today there are an increasing number of people that claim to be atheists and agnostics that want nothing to do with God and faith. Many countries still lack the resource of having a Bible translation in their own language. The gospel has still not reached many undeveloped and Muslim countries. A call to faith, holiness, and love is needed for the new coming generation to spread the gospel and expand the kingdom of God on earth. Ultimately there is a desperate need for reformation, renovation, and refocus that must take place in the mission of the church. This will have a dramatic impact in today’s society with the saving message of the Lord Jesus Christ.